Now enrolling children of all ages at all locations! 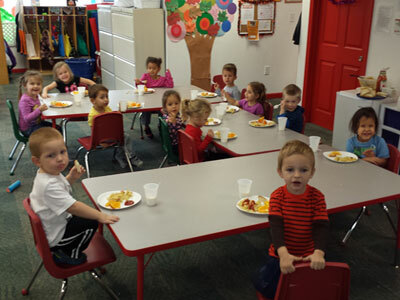 In addition to daycare we offer full Pre-k curriculum to ensure your child is ready for Kindergarten! Stop in or call your local Sweet Angels for more information! Here at Sweet Angels Daycare and Preschool we provide quality childcare in a safe, loving and professional environment. We have excellent staff and their number one goal is to meet the needs and abilities of each child’s physical, emotional, intellectual and social development. All of our teachers are qualified, early childhood professionals who have met strict enforced state standards. Each staff member must also pass a thorough check of references, health exam and state screening, before the state will approve them to work for Sweet Angels Daycare and Preschool. Our classrooms are CPR, AED, First Aide and MAT trained to ensure the safety of all our children. Our environment is hands-on, educational, and of course, FUN. Our desire is to assist and encourage each child’s ability and skills throughout every stage of their development. Your child will have a safe, clean, healthy place to grow and learn. Children learn through play. We will provide many opportunities for them to “discover” things about the world they live in. Children are really very bright and need to be treated as special individuals with much to share. Each child brings a new and exciting personality to the center and we try not to stifle their personalities, but to nurture it, and guide them in areas where they need guidance. "Sweet Angels is an amazing part of my granddaughter's life. She loves her friends and her teachers and I love knowing she's being well taken care of." "I love this daycare! The teacher and staff are amazing! I would not entrust my daughter to any one else! We love Miss Stephanie and Miss Brandy!" "I feel so happy to have found a place that treats my child so lovingly. She just loves to go every day and that gives me such peace of mind. I highly recommend!" "Absolutely the best daycare I've ever found! I hunted for months for the right one & I've been bringing my boys there for roughly the past 2 1/2 years now & they love it!!"